We saw Firefox OS as a great opportunity and a challenge to deliver a product true to the values of open web and best standards. We found it exciting to be able to deliver an app that will offer a smooth UX even for people using lower end devices. As many of the users have a very limited data plan we decided that a proper reading app offering the possibility to enjoy their favourite articles offline and without unnecessary distractions would be a key product. And so we decided to build Manana. Here is the story of how we did it. On a technological side, we decided to go vanilla but with a little help from ZeptoJS to handle the DOM manipulation. We also integrated Web Activities to hook into the sharing options in the browser, and to share the selected links via email. We are using also the Readability API to have a nice formatted version of the link. The app is simple and that’s how we wanted it to be. but we have a great plus: it is internationalized in English, Spanish, Portuguese, Polish, German, Italian. Hungarian and Greek are coming soon. 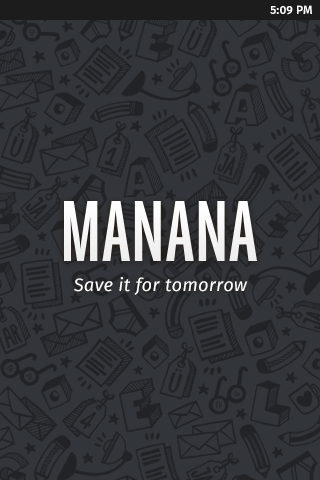 You can install Manana from the Firefox Marketplace. Below you will find a small example of how it works with a moveRight animation. Every smartphone comes with at least a small GPU, so that the CPU doesn’t have to do all the graphical calculations. It’s very much in fashion to take advantage of the Hardware Acceleration and so we do. There are some CSS3 properties that are automatically handled by the GPU, but others are not – usually the ones that are related to 3D. This is because the element (tied to the animated property) is promoted to a new layer that doesn’t suffer from repaints imposed by other properties (like left, for example. But this can change in the future). tl;dr Where you can, avoid expensive CPU work, especially on big or complicated elements. Here is a small extract of how we implemented such properties. 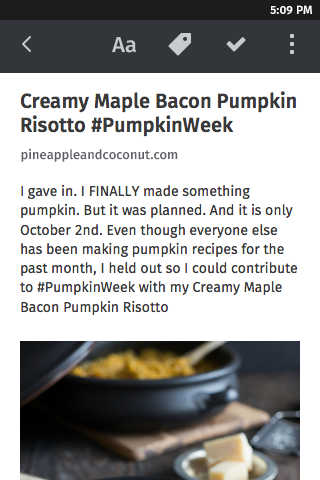 One of our favourite APIs of the WebAPIs, is Web Activities. An application emits an Activity (for example, save bookmark) then the user is prompted to chose among other applications that handles that activity. At the moment it is possible to register an application as an activity handler through the app manifest (declaration registration), but in the future this could be done inside the app itself (dynamic registration). 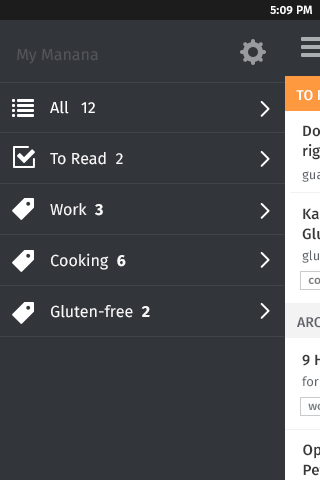 The applications included in your phone are part of Gaia, the UI of Firefox OS, and you can actually browse the source. They provide a lot of examples on how to use WebAPIs. If you are interested in the save-bookmark activity, have a look at the Homescreen app source code. Manana users can also share their resources via email, directly from the app. To achieve that, we’ve implemented the email Web Activity. It’s easy to pre-populate the email subject and body, just follow the mailto URI scheme and you are done. IndexedDB is a client side NoSQL DB. It has some nice features which make it easier working with app updates and is easy to integrate in your app, even if you’re using a framework like AngularJS. Setting up models is fairly easy and extensively documented on the web and in Gaia Apps. You don’t have a quota limit, although the Firefox OS Simulator seems to have a limit when dealing with datasets larger than 5mb. Each database is tied to an app and a version. Only one version can run at a time, which makes it easier not to break compatibility, especially if you rely on some external API. Localization is a key feature in our app. 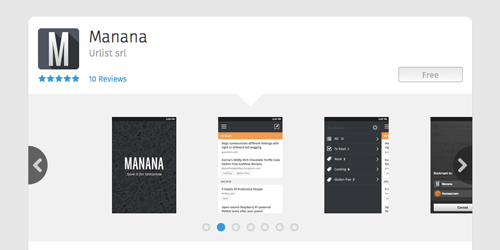 Manana currently supports 6 languages (soon it will be 8). There is no official recommendation, but after some research we decided to use the same technique that Gaia is using. This is a great feature of working with Firefox OS: the whole source code is there, and you can get inspiration by reading it. To support markdown we added some glue between the l10n.js library and marked.js. To load the help resources, Manana first does a lookup in the current installation to find the file named <resourceName>.<locale>.md. If the lookup fails, the fallback is the English version of the resource. Once the file is retrieved succesfully, the content is applied to the marked function to generate the HTML, and then added to the DOM. Retrieving files asynchronously from your local app is as easy as doing a XMLHttpRequest, but there is a case that took us some time to sort out. If the local file you are retrieving is missing, the request won’t fire the success callback (of course), but neither the error callback. It will just hang there forever. We really like OO programming by message passing, so we came up with a message based architecture. The body element acts as our global dispatcher while view root element is the local dispatcher. Global events get registered when the application starts and live as long as the app. Local events get registered when entering a view and live until we leave that view. An example of global events are the CRUD operations we want to perform on our model. Each action on the UI which changes the state of models is tied to a global event, registered on document.body. On entering a new view, we call a constructor function, which executes some initialization code. Leaving a view calls a destructor on that view, and unbinds all the local events. At the end of the day we can open the app source code without spending hours trying to figure out how things work because of framework related black magic. When it comes to Git, our hearts melt. We love git. Seriously. Git and Vim are the best pieces of software ever written. Love. Ok, lets get serious again. Update app/js/revision.js writing the current git revision hash. Create a clean zip containing the app, ready for the app store or your device. This makes our lives easier. 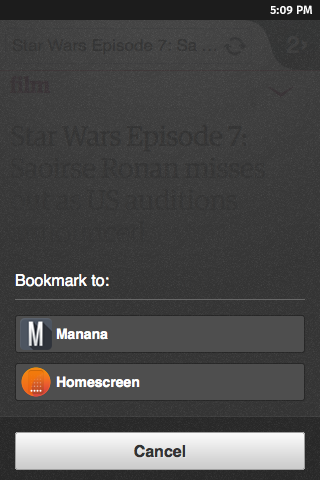 Manana relies on the Readability API to get the stripped down version of the web page. Readability is doing a really good job, but we’d like to experiment with other solutions, like parsing the page directly in the device. It’s a hard job, but it’d be cool to do it on the client side, and some work has already been done. We had a great time developing for Firefox OS. The most important thing for us, techwise, is that we developed a webapp, not an OS-specific app. We can use all the know-how we gained in the past years, all the great open source libraries we want, and we can even use the browser debug tools we use every day. To help newcomers in building a Firefox OS app, we have created a list of resources we found indispensable. Full stack developer. Open standards fanboy. Backend Developer. He loves writing stuff in golang and python using vim and noisy mechanical keyboards. He is an Art and HTML+CSS lover. Also Digital/Analog Artist/Designer wannabe. Copywriter and content creator. Writes stuff and about stuff. Responsible for content curation and localization. Really great overview on manana!! Thank you! We hope you enjoy the app as well! I have to disagree. I’ve hit the 5 MB restriction in SimpleRSS (see the Marketplace), too. Hence my app is aborting, when I try to refresh the subscribed feeds. So maybe you can implement a warning, say on 4 MB limit. To be honest I am a bit confused on indexed db on firefox os. After your comment I did some research and seems that, while the API specification allow the app to ask user if is ok to exceed the quota, on firefox os this behaviour is blocked, so you’re stuck with this 5mb limit. But can you provide links to the results you found? advise that there should be a prompt, asking the user if is ok to exceed quota limit. But here: https://bugzilla.mozilla.org/show_bug.cgi?id=827740 is stated that this prompt is suppressed. On stack overflow some user reported that they noticed a different limit between Simulator and the real device.